You can´t experience the real Costa Rica from your resort….you need to get out and explore! We invite you to adventure out of your Guanacaste beach resort and into Costa Rica's magical volcano paradise on our Arenal One Day Escape. This full day eco-tour in Arenal is the perfect way to understand why this country is one of the world´s premier ecotourism destinations. And the best part is that when you book with The Real Deal Tours, you know you are getting the best Arenal tour experience at the best Arenal tours discounts! Our Arenal Full Day Tour hits all of the Arenal regions "must see" highlights beginning with a visit to the heart of the region, La Fortuna. From here we will venture into nature with a scenic hike through Arenal National Park. From here we will traverse over area that the lava flow last destroyed, and immerse ourselves in the dense Costa Rica rainforest before coming out to spectacular views of Lake Arenal. Finally, it is time to reward yourself after the hike and head to Costa Rica's infamous Hot Springs in Arenal. First, we will start with a delicious lunch of regional cuisine served on site at the restaurant at the hot springs resort of your choice. After lunch, you will have lots of time to spend in the therapeutic hot springs, an amazing natural playground of swimming pools, waterfalls and wet bars. Your discount Arenal Day Tour is complete with a dinner stop in the town of Tilarán. Located at the other end of Lake Arenal, we will stop at one of our favorite local restaurants before returning to Guanacaste. Your Arenal tour could not be more complete! 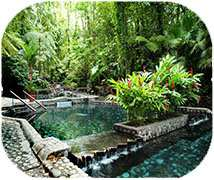 This family-friendly Arenal Volcano One Day Escape tour gives you your choice of 4 hot springs: Tabacón, Baldi, Ecotermales and The Springs. Click below for more details. The Baldi Hot Springs Hotel Resort & Spa offers beautiful architecture, lovely gardens and landscaping and impressive scenic views. Enjoy impeccable service, fresh air and the therapeutic waters of the hot springs during your visit. Children: Children must be over 6 years old. Eco Termales is the ultimate secluded getaway. 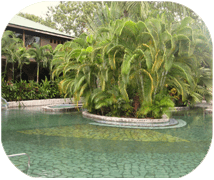 The smallest of the Arenal hot springs, only 100 visitors are permitted at a time to protect the serene environment. 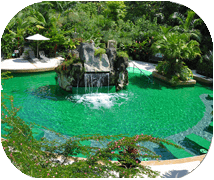 Eco Termales offers four pools ranging in temperature from 91°F to 105°F and an onsite restaurant. Arenal Volcano One Day Escape + Hot Springs Tour deposit is $40.00 per Adult and $30.00 per Child. The Springs Resort and Spa offers many amenities including hot springs, cold pools, four restaurants, a spa and fitness center. This luxury resort´s riverfront rainforest reserve location is romantic and captivating, so much so that it was a filming location for the ABC series, The Bachelor. 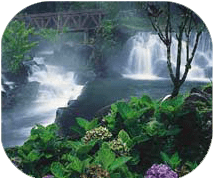 Arenal Volcano One Day Escape + Hot Springs Tour deposit is $40.00 per Adult and $35.00 per Child. 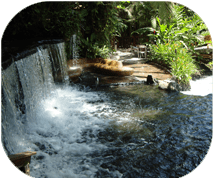 Totally luxury is yours at the world famous Tabacon Hot Springs. The stunning property features cascading waterfalls, beautiful landscaping and gardens and a river of hot volcanic water flowing through, creating natural swimming and dipping pools. It is truly an unforgettable location. Arenal Volcano One Day Escape + Hot Springs Tour deposit is $45.00 per Adult and $30.00 per Child. Paradise Hot Springs definitely lives up to its name. Lush vegetation, beautiful landscaping, lounging chairs and even the option to add cocktails or a bottle of wine make this hot spring a top choice for couples or friends celebrating special occasions. Arenal Volcano One Day Escape + Hot Springs Tour deposit is $30.00 per Adult and $20.00 per Child.